Visual Oracle is a powerful divination tool with many integrated additional functions. 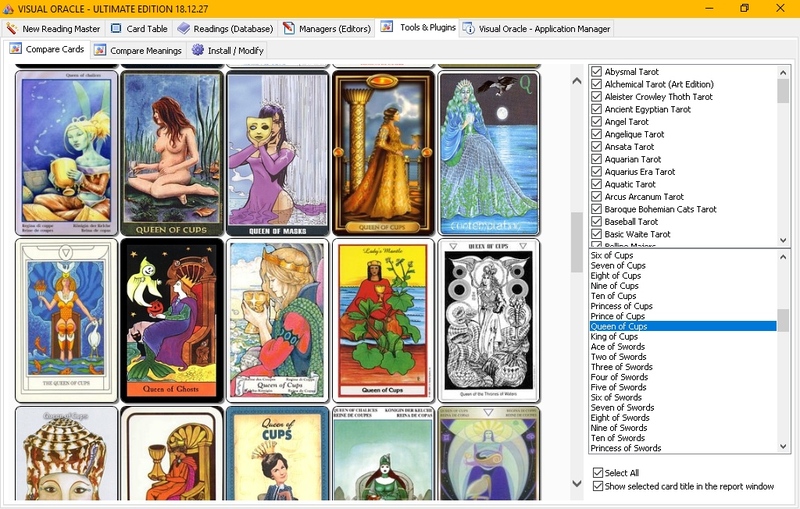 Choose from 1000 Tarot decks and Oracles or create your own from scanned images. With the Oracle Manager you can edit the selected oracle or create a new oracle. You can change card images, card back image, edit a current card data (card titles and card meanings), create a brand new oracle. 1 - Let the computer deal for you. 2 - Select each card one at a time. 3 - Re-create past deals by placing the card of your choice in any position on the spread. Name and save spreads and interpretations for later recall, along with your own notes and comments. Choose from 100 built-in standard Spreads or create your own Spreads in Spread Editor. With the Spread Designer you can edit the selected spread or create a new spread. 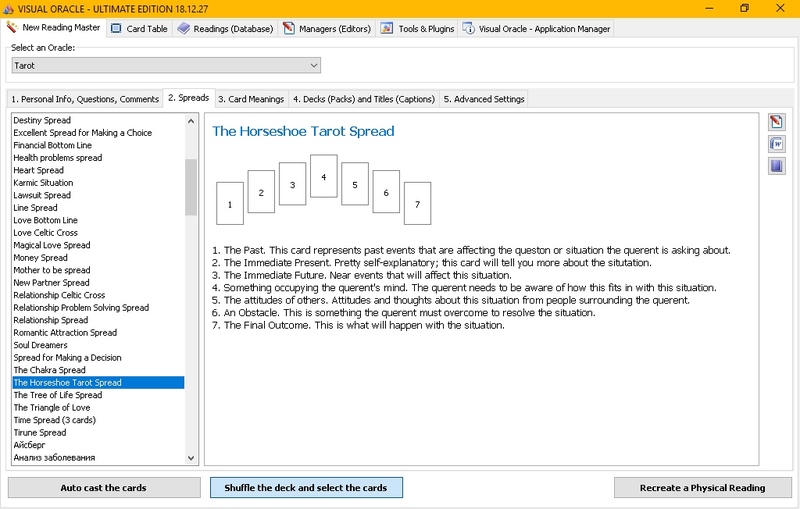 You can change card labels, edit a current spread, create an entirely new spread, change card positions. 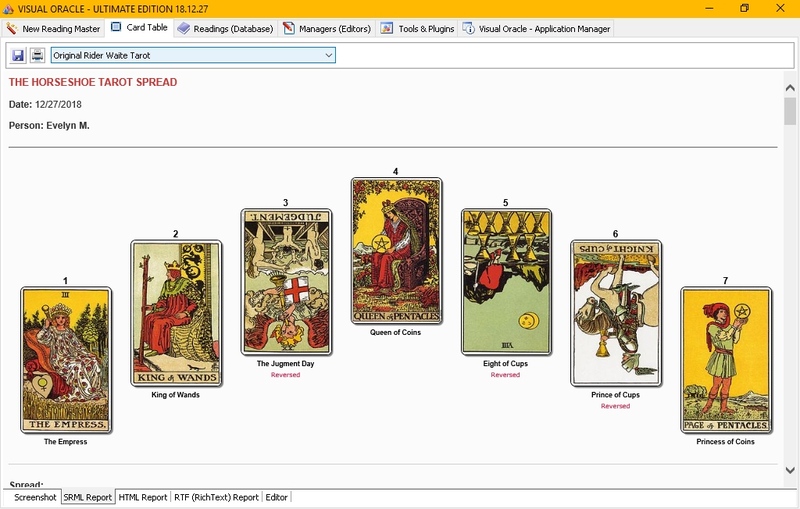 The Show Report window displays the entire current Tarot reading - graphics and text - in a scrollable window on-screen. You can Print, Save, or Load a previously saved report from this window. Name and save spreads and interpretations for later recall complete with your own notes and comments. You can deliver your customer's report via e-mail or to their browser. 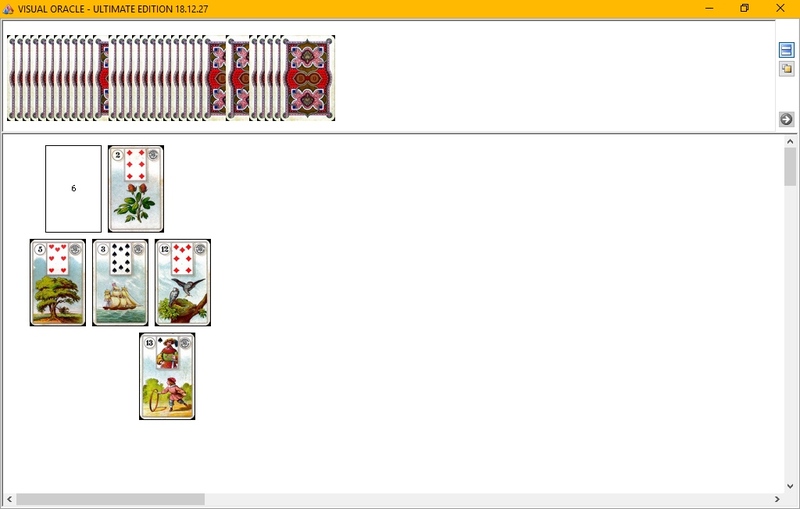 ● JPG file is just a screenshot of a card table with the layout laid out. ● RTF file formatting is accepted by most word processors and permits enhanced text features such as bold, italics, and paragraph formatting. ● HTML file permits you to open that file online and offline with your web browser. You can upload the saved HTML file to your website for online presentation. Note that all data and images are stored in one file. Use the Print Report option to send the current report to your printer. Before printing, add a name for the report and the Question or Comment for that report. These headings will be added to the printed report. Also you can Print the current Reading Layout. The top of the page includes the reading name and comment text which you can edit.